Review by AllTheBestFights.com: 2019-03-16, good exchanges between Kevin Lerena and Artur Mann: it gets three stars. The Ibo Cw champion Kevin Lerena entered this fight with a boxing record of 21-1-0 (9 knockouts) and he is ranked as the No.6 cruiserweight in the world (currently the #1 in this division is Oleksandr Usyk). He suffered his only loss when he faced Johnny Muller in 2014, since then he has won ten consecutive bouts beating Dmytro Kucher (Kevin Lerena vs Dmytro Kucher) and Roman Golovashchenko in 2018 (Kevin Lerena vs Roman Golovashchenko). His opponent, the undefeated Artur Mann, has a perfect record of 15-0-0 (8 knockouts) and he entered as the No.23 in the same weight class. He fought three times last year winning over Laszlo Ivanyi, Alexander Peil and Alexey Zubov. 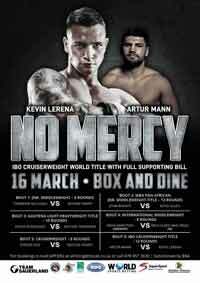 Lerena vs Mann is valid for the IBO World cruiserweight title (Lerena’s third defense). Watch the video and rate this fight!